The following article was written by Bill Chalker, and is archived here for reference and background to this case. In 1959 Papua New Guinea was still a territory of Australia. June of that year saw the spectacular sightings by Father William Gill, an Australian Anglican missionary, and 37 members of his Boianai mission. Gill made notes about the experience, which the media obtained. Stories appeared in August, causing a sensation. I have had two extended interviews with Reverend Gill and was impressed with his quiet and certain manner in relating the events. What follows comes from his own account of the affair. Only the day before the sighting, Gill had composed a letter to the Reverend David Durie, Acting Principal of Saint Aidan’s College at Dogura, to accompany a report regarding a UFO sighting made by Stephen Moi, an assistant teacher at Gill’s mission. ‘Dear David, Have a look at this extraordinary data. I am almost convinced about the “visitation” theory. There have been quite a number of reports over the months, from reliable witnesses. The peculiar thing about these most recent reports is that the UFOs seem to be stationary at Boianai or to travel from Boianai. The Mount Pudi vicinity seems to be the hovering area. I myself saw a stationary white light twice on the same night on 9 April, but in a different place each time. I believe your students have also sighted one over Boianai. The Assistant District Officer, Bob Smith and Mr Glover have all seen it, or similar ones on different occasions again, over Boianai, although I think the Baniara people said they watched it travel across the sky from our direction. I should think that this is the first time that the “saucer” has been identified as such. ‘I do not doubt the existence of these “things” (indeed I cannot, now that I have seen one for myself) but my simple mind still requires scientific evidence before I can accept the from outer space theory. I am inclined to believe that probably many UFOs are more likely some form of electric phenomena, or perhaps something brought about by the atom bomb explosions, etc. That Stephen should actually make out a saucer could be the work of the unconscious mind as it is very likely that at some time he has seen illustrations of some kind in a magazine, or it is very possible that saucers do exist, but it is only a 50/50 chance that they are not earth made, still less that they should carry men (more likely radio controlled), and it is still unproven that they are solids. The events of the next day converted the Doubting William, as the next letter graphically indicates. Life is strange, isn’t it? Yesterday I wrote you a letter, (which I still intend sending you) expressing opinions re: The UFOs. Now, less than twenty-four hours later I have changed my views somewhat. Last night we at Boianai experienced about four hours of UFO activity, and there is no doubt whatsoever that they are handled by beings of some kind. At times it was absolutely breathtaking. Here is the report. Please pass it round, but great care must be taken as I have no other, and this, like the one I made out re: Stephen, will be sent to Nor. I would appreciate it if you could send the lot back as soon as poss. As indicated by his notes, Gill saw a bright white light in the north western sky. It appeared to be approaching the mission and hovering about 100 meters up. Eventually 38 people, including Gill, teachers Steven Gill Moi and Ananias Rarata, and Mrs Nessle Moi, gathered to watch the main UFO, which looked like a large, disc-shaped object. It was apparently solid and circular with a wide base and narrower upper deck. The object appeared to have four ‘legs’ underneath it. There also appeared to be about four ‘panels’ or ‘portholes’ on the side of the object, which seemed to glow a little brighter than the rest. At a number of intervals the object produced a shaft of blue light which shone upwards into the sky at an angle of about 45 degrees. 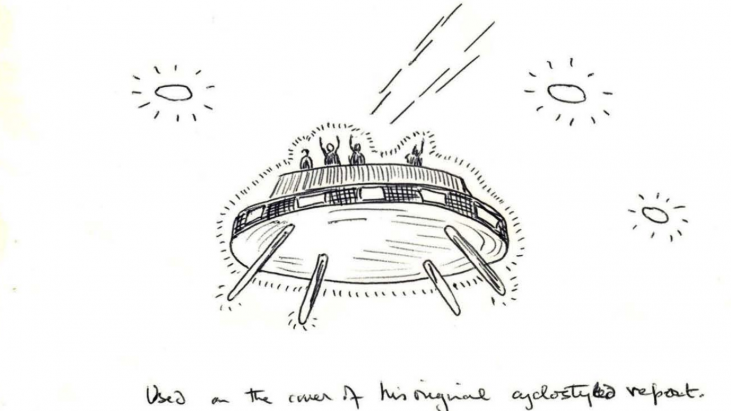 Witness’ sketch of the UFO sighting. What looked like ‘men’ came out of the object, onto what seemed to be a deck on top of it. There were four men in all, occasionally two, then one, then three, then four. The shaft of blue light and the ‘men’ disappeared. The object then moved through some clouds. There were other UFO sightings during the night. Gill described the weather as variable sky scattered clouds to clear at first, becoming overcast after. He estimated the height of the clouds at about 600 meters. The first sighting over the sea, according to Rev. Gill, seemed to be about 150 metres above the water all times. The main UFO was clearly visible and seemed mostly stationary during the twenty-five minutes of observation. Astonishingly, the aerial visitor put in a repeat performance the following night, 27 June. Gill prepared another statement. ‘Large UFO first sighted by Annie Laurie at 6 p.m. in apparently same position as last night (26/6/59) only seemed a little smaller, when W.B.G. saw it at 6.02 p.m. I called Ananias and several others and we stood in the open to watch it. Although the sun had set it was still quite light for the following fifteen minutes. We watched figures appear on top four of them, no doubt that they are human. Possibly the same object that I took to be the “Mother” ship last night. Two smaller UFOs were seen at the same time, stationary. One above the hills west, another over- head. On the large one two of the figures seemed to be doing something near the center of the deck, were occasionally bending over and raising their arms as though adjusting or “setting up” something (not visible). One figure seemed to be standing looking down at us (a group of about a dozen). I stretched my arm above my head and waved. To our surprise the figure did the same. Ananias waved both arms over his head then the two outside figures did the same. Ananias and self began waving our arms and all four now seemed to wave back. There seemed to be no doubt that our movements were answered. All mission boys made audible gasps (of either joy or surprise, perhaps both). Gill has described how he and the mission people called out to the men, even shouting at them, and beckoned them to descend, but there was no response beyond what has already been noted. Two smaller UFOs higher up remained stationary. By 6.30 p.m. the scene had remained largely unchanged, and Gill records that he went to dinner. Subsequently critics were to question this, why would someone walk away from such an extraordinary sight? ‘I’m always asked this question,’ Gill has said, ‘either in puzzlement or with a sneer. Having had about four hours of this sight on Friday night, we were not nearly so interested when it returned on Saturday night, especially after we were unable to persuade it to land. You must also keep in mind that there was nothing eerie or other worldly about any of this. It was all so ordinary, as ordinary as a Ford car. It looked a perfectly normal sort of object, an earth made object. I realized, of course, that some people might think of this as a flying saucer but I took it to be some kind of hovercraft the Americans or even the Australians had built. The figures inside looked perfectly human. In fact, I thought they were human, that if we got them to land we would find the pilots to be ordinary earth men in military uniforms and we would have dinner with them. At 7.00 p.m. the ‘No. 1 UFO’ was still present, although it appeared somewhat smaller. The group of observers went to church for evensong. After evensong, visibility was very limited with the sky covered in cloud. Nothing else was seen that evening. At 10.40 p.m., a very penetrating, ‘ear splitting’ explosion woke up people on the station. It sounded like it had come from just outside the window of the mission house. Gill felt it did not sound like a thunderclap. Nothing had been seen, but the whole sky was overcast. Other less compelling activity occurred the following night. Then it seemed the Boianai visitants had gone. But the controversy had just begun. Reverend Gill was at the time of his sightings already scheduled to return to Australia. This presented civilian groups with an excellent opportunity to assess the credibility of the reports. All investigators found Gill to be very impressive. This led one of the leading civilian groups, the Victorian Flying Saucer Research Society, to view the Gill reports as constituting the most remarkable testimony of intensive UFO activity ever reported to civilian investigators. They were unique because for the first time credible witnesses had reported the presence of humanoid beings associated with UFOs. The major civilian groups of the day, in a spirit of new found cooperation inspired by the significance of the Boianai observations, distributed copies of Gill’s sighting report to all members of the House of Representatives of Australia’s federal parliament. A letter accompanied the report, signed by the presidents of the participating civilian UFO groups, urging members of parliament to press the Minister for Air for a statement about the attitude Air Force Intelligence had to the New Guinea reports. On 24 November 1959 in federal parliament E.D. Cash, a Liberal member from Western Australia, asked the Minister for Air, F.M. Osborne, whether his department (specifically Air Force Intelligence) had investigated the reports. The minister’s reply did not address this question, but instead focused on the general situation, indicating that most sightings of UFOs were explained and ‘that only a very small percentage, something like 3 per cent of reported sightings of flying objects cannot be explained’. 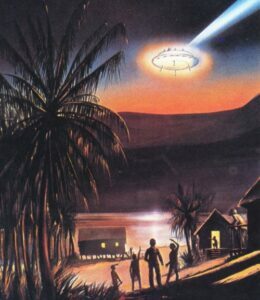 A representative of one UFO group was advised by the Directorate of Air Force Intelligence that the Department was awaiting ‘depth of evidence’ on the New Guinea sightings. However, the department had not even interviewed Gill. Finally the Minister for Defence requested a report and the RAAF interviewed Gill on 29 December 1959, some six months after the sighting. Gill’s recollection of the visit is that the two officers from Canberra talked about stars and planets and then left. He heard no more from them. ‘Although the Reverend Gill could be regarded as a reliable observer, it is felt that the June/July incidents could have been nothing more than natural phenomena colored by past events and subconscious influences of UFO enthusiasts. During the period of the report the weather was cloudy and unsettled with light thunder storm. Although it is not possible to draw firm conclusions, an analysis of rough bearings and angles above the horizon does suggest that at least some of the lights observed were the planets Jupiter, Saturn and Mars. Light refraction, the changing position of the planet relative to the observer and cloud movement would give the impression of size and rapid movement. In addition varying cloud densities could account for the human shapes and their sudden appearance and disappearance’. My own close analysis of the reports suggests that the RAAF ‘explanation’ of either known planets seen through fast moving cloud, or natural phenomena’ does not bear up. Over the years there have been a number of ‘explanations’ put forward to account for the Boianai sightings, including astronomical misidentification, hoax, cargo cult effects, and that Gill had myopia and astigmatism. (In fact at the time he was wearing correctly prescribed glasses). None of these satisfactorily address the evidence. Dr Alien Hynek, and staff at his Center for UFO Studies, went to great lengths to investigate and research the affair. Hynek and Alien Hendry, the the center’s chief investigator, concluded the ‘lesser UFOs’ seen by Gill were attributable to bright stars and planets, but not the primary object. Its size and absence of movement over three hours ruled out an astronomical explanation. My own discussions with Gill led me to the same conclusion. Most recently there was an attempt at explaining the whole affair away by suggesting that Gill and the other witnesses were confused by a false horizon, and that all they had been watching was a brightly lit squid boat and crew too busy to do more than just wave at the people on shore. This idea is not tenable when one realises that Gill was certain that the object he saw was at a 30 degree elevation in the sky. A more radical attempt to dispose of the Gill case came from UFO skeptic Daniel Cohen in his book Myths of the Space Age. The Boianai ‘visitants’ still stand as remarkable evidence for an impressive aerial anomaly and are regarded as some of the best entity reports on record. At the time of writing I spoke again with Gill. He still remains puzzled by what he saw and was pleased that an authority like Dr Hynek had independently interviewed him and some of the other witnesses and travelled to the site. While he accepts that the sightings remain unexplained, he questioned my characterization of some attempts to explain them as ‘silly’. He felt that these ‘explanations’ were serious attempts to bring understanding to the events. I think that attitude encapsulate the integrity of Gill and the reality of the affair. In 1973 Alien Hynek visited Australia and Papua New Guinea and found six of the witnesses to the Boianai events. They all supported Gill’s version of what had happened. These documents were obtained from Philip Mantle, and are used here with permission.